NLGJA has many to thank for making Coming Home, our 25th Anniversary Celebration National Convention & LGBT Media Summit, such a memorable success this past week in the Bay Area. We appreciate the support of so many volunteers, with NLGJA President Jen Christensen and NLGJA Vice President for Broadcast Ken Miguel leading the way as convention co-chairs and Tracy Baim and Michael Yamashita heading up the LGBT Media Summit as co-chairs. Together their vision and attention to detail made the stellar workshops, plenaries, reception programs and other activities possible. We thank the many speakers, presenters and moderators who shared their ideas and insights. Convention-goers were fortunate to hear headliners Sam Champion of The Weather Channel and Richard Quest of CNN’s Quest Means Business and those who shared their experiences of what it’s like to be “Out at the Top” and “Out on the Air.” Throughout, Geoff Dankert and Marshall McPeek served as emcees providing key agenda points, informative trivia and more in a lively format that tied the weekend together, and we thank Eden Lane for pitching in as emcee of the Friday afternoon plenary. 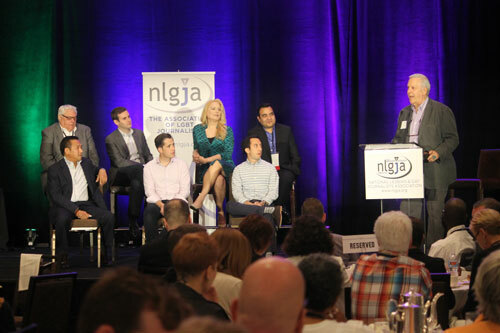 NLGJA was excited to highlight six new inductees into the LGBT Journalists Hall of Fame and hear from some of them as they shared their groundbreaking work and experiences. In honor of the 10th anniversary of the Hall of Fame, NLGJA featured all 34 inductees in the mirrored hall of the convention hotel. 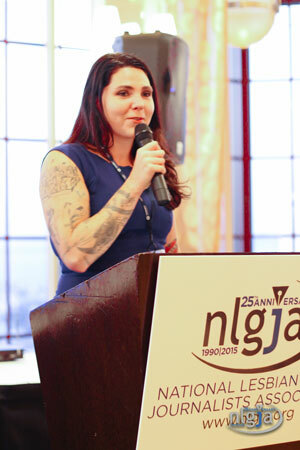 NLGJA also honored the 2015 winners of the Excellence in Journalism Awards, especially the 2015 Journalist of the Year J. Lester Feder and Sarah Pettit Excellence in LGBT Media Winner Trish Bendix. Thanks to all the convention registrants, your paid fees helped foot the bill for it all. It was great to see our silver anniversary bringing together those with their “First Timer” pink ribbons and the “First Generation” attendees who were the original members of NLGJA. Our Lifetime Members welcomed Sam Champion to their ranks, one Lifetime Member – Javier Morgado – made a $2,500 contribution in honor of NLGJA’s 25th anniversary, another Lifetime Member – Meredith Vieira – gifted a Lifetime Membership to Eden Lane and a couple of Lifetime Members – Randy Lively and Sean Lewis – also became new monthly donors to help sustain NLGJA’s future. The Connect Student Journalism Project produced a variety of compelling stories by the staff of 12 student journalists. It is with great appreciation that we thank their volunteer mentors and Lead Project Manager Caroline Que, along with the project’s sponsors. Be sure to check out this great coverage at http://www.nlgjaconnect.org/2015. Thanks to those who secured and donated silent auction items, made a donation, volunteered for the critiques, advertised with NLGJA and joined us as exhibitors at the Career & Community Expo. 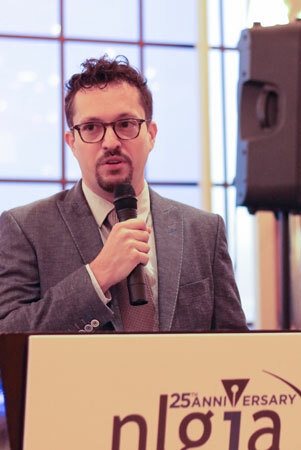 A special thank you goes to Steven Petrow, and those whose contributions he matched including many of our Unity partners, who supported NLGJA in honor of soon-to-be spouses NLGJA President Jen Christensen and First Lady Holly Crenshaw. It was such an incredible trio of days. Be sure not to miss it all next year, September 8-11, 2016, in South Beach Miami.